Washington (CNN) – Virginia Lt. Gov. 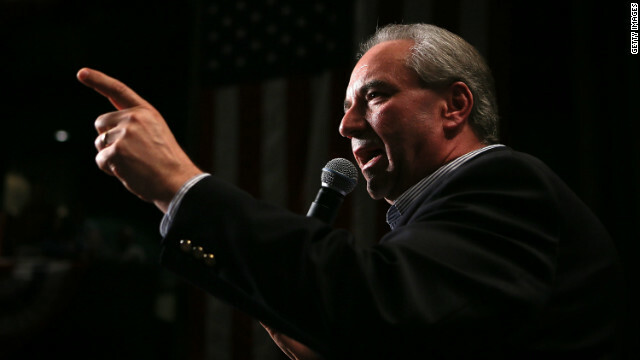 Bill Bolling dropped his bid for the Virginia governorship late Tuesday, a move that clears a path to the Republican nomination for his primary opponent Ken Cuccinelli. "I know that my decision will surprise most people and disappoint many people, but I'm confident it is the right decision," Bolling wrote in a statement released Wednesday morning. "I hope that my friends and supporters, as well as those who have chosen to support Mr. Cuccinelli, will respect and appreciate the reasons for my decision." Those reasons included the move from state GOP officials earlier this year to hold a nominating convention instead of a statewide primary - a process thought to favor Cuccinelli, the candidate with a closer connection to the party's conservative, tea-party friendly base. "I know how divisive conventions can be, and I was concerned that a prolonged campaign between Mr. Cuccinelli and me could create deep divisions within our party," Bolling wrote. "The convention process would have forced Republican activists to take sides against their friends in local committees all across our state. The wounds that can develop from that type of process are often difficult to heal." In his statement, Bolling did not offer an endorsement of Cuccinelli, saying he was "surprised and disappointed" in Cuccinelli's decision to run for governor instead of forming a "united Republican ticket in 2013." The Republican Governors Association embraced Cuccinelli as their candidate in the Commonwealth, writing in a statement "Republicans are now positioned to move forward united and focused on electing a results-oriented leader." Bolling's decision sets the table for a titanic 2013 clash between Cuccinelli, the state's Attorney General and a fierce social conservative with a national grassroots following, and likely Democratic nominee Terry McAuliffe, the irrepressible former chairman of the Democratic National Committee. Bolling, first elected to his post in 2005, was backed by Virginia Gov. Bob McDonnell and served as Mitt Romney's campaign chairman in the commonwealth during the Republican's failed presidential bid. But even with that blue-chip political resume, Bolling faced long odds against Cuccinelli. A source familiar with Bolling's thinking told CNN that he recognized "how difficult it would be to win the nomination" against his GOP rival. Bolling "did not want to divide the party," the source said. In his statement, Bolling said he would focus on "making certain that the candidates keep their focus on the important issues facing our state and offer a positive and realistic vision for effectively and responsibly leading Virginia." The decision is a blow to Democrats who had hoped a primary battle between Bolling and Cuccinelli would sap each candidate's resources and expose yet another rift between the GOP's establishment and insurgent factions. In a Wednesday statement, the executive director of the Democratic Governors Association wrote Cuccinelli "would be the most extreme major party nominee for governor in Virginia's history." "He has spent the last four years launching anti-science, anti-equality, and fringe partisan crusades at the expense of doing the people's business. There's no evidence that his focus as governor would be any different," Colm O'Comartun wrote. McAuliffe also painted Bolling's decision as an indication that extremist views on the right were winning out, writing "It is disappointing that more mainstream Virginia Republicans are being driven out of leadership by the far-right. Virginia voters have repeatedly made clear that they prefer mainstream leaders building consensus instead of politicians pursuing their own ideological agenda." Virginia is one of two states, along with New Jersey, that will hold gubernatorial elections next year. I hope the Democrat wins. This GOP game playing has got to stop. Didn't you people learn anything from the national election? The Tea Party is poison. They were pretty much ignored in favor of more moderate candidates. And all that money that was poured into the campaign. The money that the Kochs and Adelson poured into the GOP could have gone a long way to paying down the debt. LOL The rich are crying about being asked to pay a more fair tax, but they had millions and millions to try to buy the presidency for the loser, Mitt Romney. I paid higher taxes on my salary than, Mitt did on his income from investments. The should be taxed the same. I paid more than the millionaire and the GOP cannot even understand the problem that ordinary Americans my have with that system. Mr. McAuliffe, I wish you well in your Virginia area contest however, that`s where it ends. I found your comments about and treatment of then candidate Obama disrespectful in the 2008 primaries. Sorry sir, but you can`t be awarded on the national stage. We are watching and we demand accountability. If we let you slide, it will never stop. It seems that cuchimama is now all over the place in the area. Let's remember confederate month, probing pregnant women, just said that the election was rigged by the Democrats. He is another rethug flake! The gop bafoon party is finnished in the next elections and have the goofball teaparty and the lobbyist crook rover norquest to thank for it .